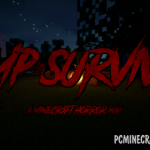 Cool Pvp map where one player becomes the murderer, and the rest of the players surviving. The task of these players is to repair three generators, and then escape through one of the two provided doors. The killer has to deal with the victims before they get out.